Cosmetics industry has emerged as one of the most competitive fields of online ecommerce. The beauty and wellness industry is ever evolving and is currently witnessing a revolution. With the rise in ecommerce business, selling cosmetics online has gained momentum. Online cosmetic shops are constantly developing new ways to stand against the thriving competition. While social media campaigns are their go-to for accentuating the cosmetic products and gaining credibility, other ways need to be explored to make customers trust the brand and buy their products. Although ecommerce is seeing a boost, customers are highly cautious while buying beauty products online. People have become very conscious about their health and skin and are observed to prefer in-store buying of cosmetics rather than shopping them online. In such cases, giving customers a feel of in-store while shopping online is one way to gain their trust. And this can be made possible by offering your customers live video chat assistance. This will level up your customers’ experience while buying beauty products online. Live video chat can prove to be a unique solution to successfully engage customers who are willing to buy cosmetic products online. Adopting live video chat support will help build trust amongst customers and lead to increased sale of cosmetics. Since customers have become aware of their hygiene and beauty more than ever, they are keen to know the effects of products on their skin and body. Company representatives can give detailed information about their products to customers through video chats. The advisors can answer customer doubts and reduce their concerns substantially. The representatives can boost the company sales by establishing a transparency in sales while performing add-on sales. Agents can make customers aware of the beneficial effects which can further strengthen customers’ trust. Every customer is unique and requires unique products that are suitable for them. Cosmetics unlike clothes, do not suit everyone. Various factors like skin type, skin health, allergies, etc. need to be taken into consideration while buying beauty products. Company experts can assist customers in selecting the right product. They can ask them about their skin conditions and requirements, and then provide a tailored solution. For example, through a live video chat, looking at the customer, company agent can suggest the product that would complement their skin tone. Whenever a new cosmetic product is launched in the market, people are always hesitant to try it out. Consumers tend to stay loyal to the products that they have been using for a long time. To overcome this problem, company representative can introduce these products to customers through video chats and entice them to try it out. In addition, they can conduct a live demo for the customer to watch which can help reduce their doubts about the product. This will also reduce the expenditure of door-to-door selling. Many a times, customers are looking for expert advice while buying cosmetics. Video chats can be used for providing this assistance. Company experts can give beauty tips to their customers as an incentive. This will increase customer engagement which will in turn lead to rise in sales. 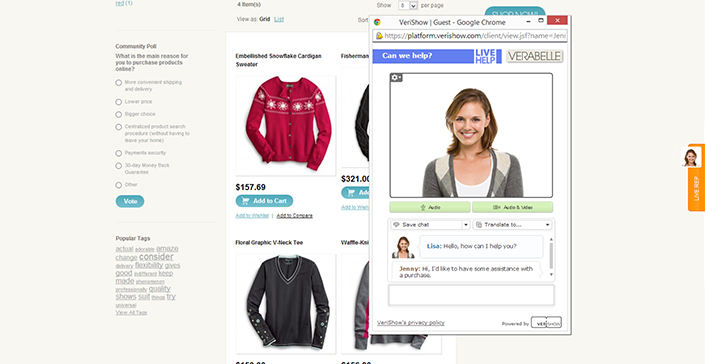 A video chat solution like the one provided by VeriShow can help in personalizing interaction with customers. Through video chat support, online cosmetics shopping can be made trustworthy for customers as equal to in-store experience. Along with video chat, co-browsing tool can also prove to be beneficial for the cosmetic industry. Using co-browser, customer executives can help customers in finding a particular product when they visit your website. This will assist in giving the customers an in-store experience. To add to customer convenience, providing these services on mobile devices will level up online cosmetic shopping experience.